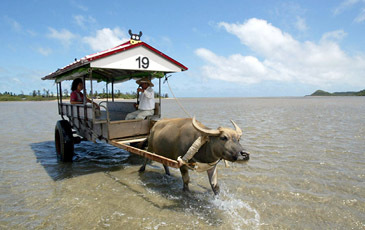 Water buffalo carts take visitors from Iriomote to Yubu. SAY Okinawa, and the word conjures up one of the last major battles of World War II and the enduring presence of American troops in Japan. But Okinawa is so much more: a chain of hundreds of islands stretching some 600 miles southwest of mainland Japan into the East China Sea (also called the Ryuku Islands), home to a distinctive subtropical culture and nature that few foreigners - and not many Japanese for that matter - have ever seen. 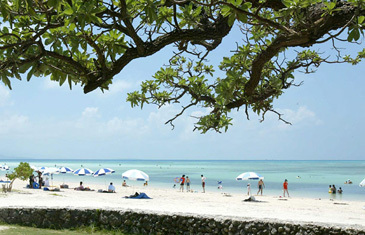 Farthest from mainland Japan, closer to China and Taiwan, are the Yaeyama islands of the Okinawa chain. This scattering of islands and islets, with no memory of wartime battles and no experience of being a base for United States Marines, is a world away from the sometimes politically tense atmosphere on Okinawa Island, some 250 miles away, where the Marines are based. Yaeyama is the corner of Okinawa where the laid-back Ryukyu culture - named after the independent kingdom that existed here before it was absorbed by Japan - is best preserved. The sense that Yaeyama is spiritually independent, separate from mainland Japan, survives to this day. Mainland Japanese who have moved here are referred to as immigrants by locals, and first-time tourists from the mainland often say that Yaeyama is more exotic than going abroad. On the mainland, a rising interest in Okinawan food and music has been luring more Japanese tourists to Yaeyama on island-hopping tours. Island hopping in Yaeyama begins in Ishigaki, one of the two big islands and the only one with an airport, about a three-hour direct flight from Tokyo. Ishigaki Island has several spots famous among snorkelers and divers, including Kabira Bay, in the northwest, whose emerald blue water with fish-filled coral reefs can also be viewed from glass-bottom boats. But as the only urbanized island in Yaeyama, Ishigaki is perhaps best to use as a springboard. On a four-day trip in May, a friend and I found that the Ishigaki port is the meeting place for all Yaeyama island hoppers. There, two companies operate high-speed ferries to the surrounding islands, and with only a few exceptions, getting from one small island to another requires going through this port. Taketomi Island, a 10-minute ride southwest of Ishigaki, is a flat, oval-shaped, 1,500-acre island, with a population of only 328. It is small enough to hike or cover on rented bicycles. Taketomi's main attraction, though, is the village of 160 houses in the middle of the island, which is laced with narrow, sand-covered streets. Traditional, one-story Ryukyu houses and gardens are surrounded by low stone walls. The houses are made of wood, stone or concrete, and their roofs are invariably made of red tiles and adorned with at least one shisa - a lion or dragon to protect the household. The Chinese influence was hard to miss. The Ryukyu kingdom, officially made part of Japan in 1879, had long paid tribute to China, so its present culture is a synthesis of Chinese, Japanese and indigenous traditions. 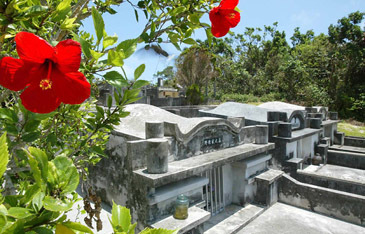 Like those found elsewhere on Okinawa, but not on mainland Japan, the cemeteries were composed of only a few plots; they consisted of mausoleums made of large, gray slabs of stone with rounded roofs resembling a turtle's shell. The handful of restaurants on Taketomi offered simple Okinawan cuisine, which, heavy on vegetables and low on fat, is one reason that Okinawans historically enjoyed the longest life expectancy in Japan. The open-air Garden Asahi serves goya chanpuru, an Okinawa staple made of bitter gourd, meat and eggs. Breakfast at the Sapuna Ya, a guest house with three thatched-roof cottages, included passion fruit, papaya and pineapple grown on the island. As further proof that we were far from Tokyo, we didn't lock our cottage, because, well, it had no locks. There was the same carefree attitude on Iriomote, which is the other big island in Yaeyama but still has a population of only 2,200. Although many of Iriomote's inns provide shuttles, we rented a car, which we were told to return by simply leaving it at the port - doors unlocked, with the keys inside. On Iriomote, the natural setting is the draw. Covered by mountains, crisscrossed by rivers, the island still has the dense jungles and mangrove swamps that made malaria rampant until after the war and kept the population down. Through our hotel, the Niraina Resort, we booked a guided, half-day canoe trip up the Pinai River. The river, with clear water only a few feet deep, meandered through walls of verdant mangrove swamps. The mangrove trees rose 15 to 20 feet, as their branches sent down roots that were embedded, like claws, in the muddy riverbanks. At some points, the river narrowed so much that we could smell the mud and the trees on the banks; then it widened so that the silence seemed to amplify sounds, like the occasional cry of a bird or the slicing of our paddles through the still water. Then, as we had been dulled by the tranquillity, a three-foot brownish snake dangling from a tree dropped into the river, near our canoes, before it swam swiftly to the other side. Iriomote is surrounded by several islets, one of which has a population of one. With no invitation, it felt rude to go there unannounced. Instead, we went to Yubu, an island off Iriomote's east coast. The island, uninhabited since it was submerged during a typhoon in 1969, has been transformed into a garden featuring tropical plants, flowers and animals. The highlight of a trip to Yubu, though, is the actual crossing: carts pulled by water buffaloes ply the 400-yard-wide shallow channel. Our buffalo was Goro, a 15-year-old male who, as his master explained cheerfully, was the strongest of the bunch and could pull a 20-person cart. Some islands are trying to define their image to attract tourists. Kohama Island, with a population of 570, is struggling to define its strongest selling point, advertising itself as the land of sugar canes and the setting for "Churasan," a wildly successful television series about a local girl who moves to other parts of Okinawa and even Tokyo before returning to Kohama. It seems to have settled on becoming a resort island, however, with a new, not fully completed 58-room hotel. The hotel, the Villa Hapira Pana, even has an 18-hole golf course. But even those islands that are not trying to attract tourists are worth a visit. The residents of Hatoma, all 58 of them, found an unusual way to keep the island alive. 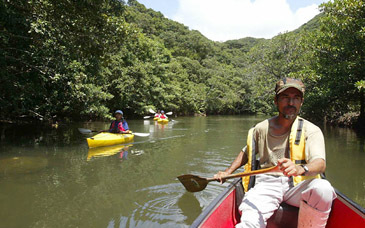 Over the years, the young people have left Hatoma, just north of Iriomote, leaving only a graying population. To keep the school's elementary school open many of the islanders have become foster parents to children who were unable to fit into schools elsewhere and dropped out. And then there is the most remote of the Yaeyama islands, Yonaguni, about 80 miles west of Ishigaki and 75 miles east of Taiwan. Isolated from even the rest of Yaeyama, Yonaguni developed its own language and now has only about 1,726 people. About 11 square miles, the island has a coastline punctuated by caves and coral reefs, while the surrounding waters contain ruins that are several thousands of years old. It is surrounded by rough seas that the islanders scour for fish, including marlin. On a clear day in Yonaguni - guni' means country - it is possible to see Taiwan and easy to imagine that you are, indeed, in another country. Nippon Air, www.ana.co.jp/eng/index.html, and Japan Airlines, www.jal.co.jp/en, both offer early morning direct flights to Ishigaki island from Tokyo, taking about three hours. Fares start about $320 one way, at 112 yen to the dollar. The Web site www.japan-guide.com offers a good orientation to the islands. There are eight inhabited islands in the Yaeyama archipelago. The only way to get around these islands is by high-speed ferry; the major companies are An'ei Kanko, (81-980) 83-0055, Yaeyama Kanko Ferry, (81-980) 82-5010, and Fukuyama Kaiun, (81-980) 82-4962. You can buy tickets at their offices at the port in Ishigaki. The one-way fares range from $5.30 to Taketomi to $32 to Yonaguni island. On Taketomi, the best way to get around is by bicycle. Many shops rent them, and some will deliver bicycles to your hotel. At Pochi Cycle, (81-980) 85-2215, bikes cost $13 a day. There are three ports on Iriomote: Ohara, Uehara and Funaura. Choose the port closest to your hotel and the hotel will pick you up. You'll need a car on Iriomote. The most inexpensive is Iriomotejima Seibu Rent-a-Car, near the Uehara port, (81-980) 85-6526. Rates are $27 up to 3 hours and $37 up to 24 hours. The water buffalo cart crossing to Yubu costs $12 round trip, and includes entrance to the botanic garden. Though small, Kohama is too hilly for bicycles, so a car is recommended. Two agencies are Kohamajima Kanko An'nai Center, (81-980) 85-3551, and Kohamajima Kanko Rent-a-Car, (81-90) 5939-3418. Rates are $74 a day. Sobadokoro Takenoko, on Taketomi Island, (81-980) 85-2251, is a good place to experience Yaeyama soba, the local-style ramen noodle with soft, shredded pork ($4.50). It is open daily 10:30 a.m. to 4 p.m.
Hatsue is near Uehara port on Iriomote, (81-980) 85-6023. It serves fresh fish, including sashimi of subtropical fish not found on mainland Japan. Dinner for two with drinks runs about $60. Open 5 to 11 p.m. daily except Tuesday. Sea Side, on Kohama, (81-980) 85-3124, is a traditional Yaeyama diner packed with locals. The food is cheap and delicious; a set meal is $5 to $6. Open 10 a.m. to 2 p.m. and 5 to 9 p.m. Closed Sunday. Takana Ryokan, on Taketomi, (81-980) 85-2151, is a Japanese-style inn. It has nine Japanese- and three Western-style rooms, starting at $78 a person, including dinner and breakfast. Niraina Resort, near Uehara port on Iriomote, (81-980) 85-6400, is a three-room villa near the Hoshizuna no hama (beach of star sands). It has a very homey atmosphere, and offers many day trips, including sea kayaking, canoeing trough mangrove swamps and scuba diving. Rooms start at $102 a person, with breakfast. Villa Hapira Pana, Higashiomote, Kohama, (81-980) 84-6300, is a 102-room resort still under construction but with an 18-hole golf course, bar and swimming pool. Rates begin at $106 a person, including breakfast.